Piping Hot Recorders: What do we do? We play music! Most of this is performed on recorders of various sizes, but we have also been known to branch out, as Piping Hot alt.instruments, into some of our other instruments, e.g., accordion, flute, guitar, violin, clarinet, as well as a bit of singing. Mostly though, we play recorders, in arrangements from 2 up to 9 parts, depending upon who is available at the time. As well as music written, or arranged, specifically for recorder consort, several of us have fun writing our own arrangements. 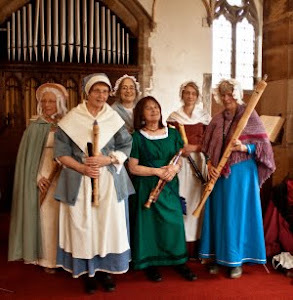 We've enjoyed playing for several local WI groups - have we played for your WI yet? And if you ask us nicely you might persuade us to help raise money for a charity. Why not ask us to come and play for you?